We go through a series of questions to see if we're a good fit for each other. What type of contractor are you looking for? What kind of budget do you have in mind? How many decision makers are there? Who are they? We walk through the entire process with you, and measure the areas involved in the project. We take pictures and ask questions so we can get a good understanding of what you want to achieve. We bring a 3D design plan of the addition and a detailed rough estimate of the cost. 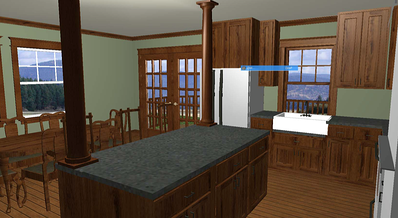 Our computerized images use your actual space and dimensions and lets you envision the addition or updates we're going to make. Once you're comfortable with the rough scope and rough estimate, the project development agreement is signed. It describes the design process and how the architectural plans will be developed. It also describes the final pricing and Proposal phase (detailing the scope of work). We'll schedule a meeting with the architect at your home so they can gather all the precise measurements. The Architect works on preliminary plans. Once you’re pleased with the preliminary plans, the architect does the final construction documents. We submit the building permit application and the final plans to the local municipality for approval. This process takes 2-3 weeks. We’ll schedule a meeting with the subcontractors to meet at your home. They’ll get a full set of plans and we will walk them through the project so they can provide us with fixed cost pricing for their areas of work. This is the final meeting before building begins. We go over final pricing and final plans to make sure we are in agreement. You meet the Lead Carpenter who will be running your project and we walk him through all of the details. We also go over a final construction schedule and expected completion date. We're ready to get started working on your new home! 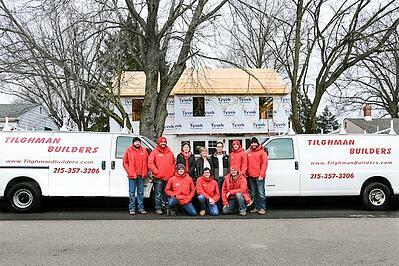 Every 2 weeks there’s a prearranged progress meeting with the the Tilghman team, Lead Carpenter and the homeowners. We discuss how the project is progressing, the schedule, and any changes needed. The final inspection is conducted by the municipal building inspector to make sure everything is done correctly and completely finished. 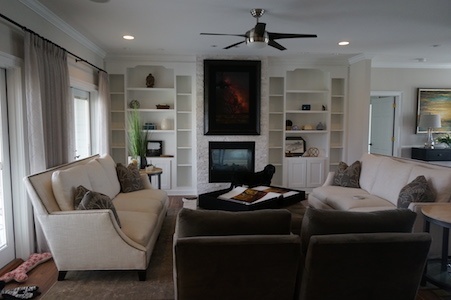 A final walk through is scheduled with the Tilghman team and the homeowners to make certain everything has been completed to their satisfaction.